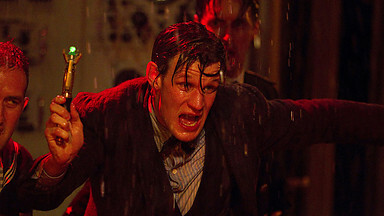 Series 7 Part 2 episode 3 of 8 (or whatever it should be numbered) or Cold War arrives with Mark Gatiss script giving us a claustrophobic, submarine drama and the return of the Ice Warriors (hurrah)! By the time this broadcasts there will be much finger-crossing from fans that we don’t get the same level of unhelpful comment we had after The Rings of Akhaten. How will the Eleventh Doctor fare? Will we learn more about Clara? I predict that we will come out the other side nice and positive and it will be all smiles. I’m more interested in how Nick Briggs does as the voice of the Ice Warriors and whether or not they finally get a decent storyline. En route to Las Vegas the TARDIS materialises on a Russian submarine in the middle of the Cold War. The Russians have found a mysterious something in a block of ice 5,000 years old that when defrosted goes on the rampage and sends the submarine to the bottom of the sea as the TARDIS appears. The mysterious something is an Ice Warrior and with a series of escalations of tensions (allegoric to the Cold War itself) the Ice Warrior (via a long sequence of scenes outside his suit) is on the verge of triggering all out nuclear war to destroy the Earth all because he got annoyed when defrosted – maybe they should have left him behind. In a blast from the past the TARDIS goes off stage thanks to the HADS (Hazard Avoidance Displacement System). We also find out that the Warrior is a famous Martian hero and there is a moment when destruction seems inevitable until the Doctor threatens to destroy the submarine with his ubiquitous sonic screwdriver. Luckily a massive Ice Warrior space ship arrives, saves the submarine and whisks the lone Ice Warrior away leaving the Doctor and Clara with the small problem of finding the TARDIS at the South Pole! Having watched this time-slipped I was able to get a lot of twitter reaction before writing this; I also read a few reviews that I will refer to, those being JR Southall’s review on Starburst and Carlisle Who Fan’s review. JR finds this to be akin to a remake of Dalek and while I can see where he draws his evidence from I am not completely sold on this in terms of the way the endings differ so much. JR does make points about the stacotto nature of the plot and here I felt the story was weak; very little development of character, David Warner is largely wasted though does get some scenes that allow Clara to share some of her experience. While good this was not taken forward enough for me. Carlisle Who Fan wonders who will complain about the film Alien being the template and comes up with a reasonable defence. I like this argument but actually think that the complaint still stands; Alien was all about a creature in the shadows, the odd claw and taking out the crew one by one – this is exactly how Cold War worked. Even if we accept the premise that Doctor Who invented base under siege (it didn’t – see A for Andromeda (1961), and the novel Who Goes There? from 1938 by John W Campbell that gave us both the1951 and 1982 films entitled The Thing). Not only was this stylistically all bit identical (which is my annoyance) but also had every submarine cliché that could be crammed in though didn’t try to fix the sub. If the Ice Warrior space-ship hadn’t arrived how would they have survived? None of the crew made any serious effort to fix anything. The plot also petered out with a long scene at the end staring at the sky to show off the CGI space-ship. With some craft an inner plot could have happened – crew split into two areas of the submarine, Doctor and Clara separated, anything. It all fell flat for me. In his review Carlisle Who Fan also mentions a tweet from Paul Cornell calling Clara the new Sarah Jane Smith; a neat idea which bears thinking about (but not here). I did feel that as portrayed here Clara was timid and lacked a certain spark that she had at times in Bells and Rings. I now find the three Clara’s to be quite distinct in style. Although cheesy I like the HADS being back though hopefully not for long. I predict we might see the Fast Return Switch soon (or maybe a problem with the mercury fluid link! ), if nothing else though I am hoping next weeks story lives up to the trailer. So, am I too bleak? Did I miss something? Let me know! 2013 – the year of the Ice Warriors? Loved having the Ice Warriors back! I just wish the story had been more about them as they can be rather than a fairly generic alien. Taking the Warrior out of armour for the bulk of the story was a let down for me.